We know you’re anxious to start touring Santa Fe’s galleries and museums, but you don’t even have to leave your hotel to experience a taste of the local art scene. 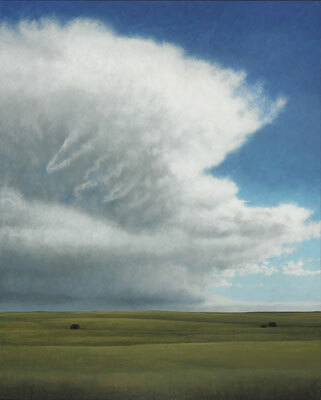 Several of Santa Fe’s best hotels have fine collections of work by New Mexico artists. They are worth checking out, even if you’re not staying there. Here’s a sample of some of our favorites. This historic property in the Tesuque Valley is named for the tiny retreat that Archbishop Jean Baptiste Lamy built for himself in the 1850s, and which still graces the site. It is fitting then, that the first artwork you see upon entering the resort’s lobby is a gorgeous, sunlit image of Lamy’s lodge, painted by early Santa Fe artist Theodore Van Soelen. 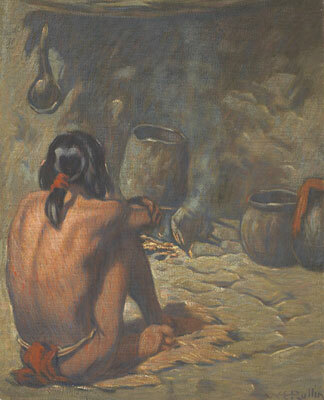 He arrived in Santa Fe in 1926 and settled in Tesuque, where he continued painting until his death. He is one of the original members of the Santa Fe Art Colony. In the dining room, you will encounter four enormous canvases by Van Soelen’s contemporary, Warren Rollins. He was one of the first artists to be admitted to the ceremonies of the Hopi, Crow, and Blackfeet. 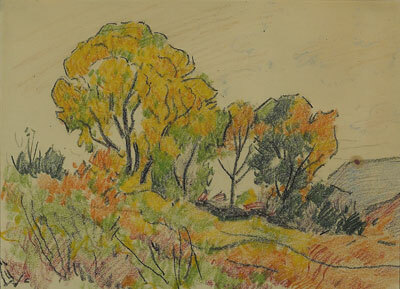 Although Rollins was considered the “dean of Santa Fe painters” in the early 20th century, apparently he needed to pay for his lodging at the resort with these paintings. W.E. Rollins was latered commissioned by the Fred Harvey hotels and the Atchison, Topeka and Santa Fe Railroads to provide art for the hotels and train stations throughout the southwest. ollow the trail of fascinating historical photographs down the steps and into El Charro room for a look at the amazing copper bar. Covered with stamp work and 3-D copper flowers, it is a piece of Southwestern folk art like no other we’ve seen. Several original Ben Ortega statues are located throughout the property. Ben Ortega is a local santero from Tesuque, and Mamisita Thorpe (the matriarch of the Thorpe family – original owners of Bishop’s Lodge) promoted local artists. 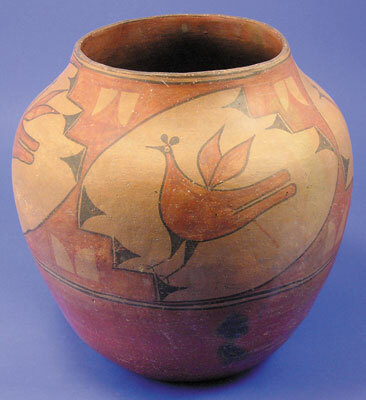 The centerpiece of Eldorado’s collection is a magnificent Zia jar made in the 1920s by pueblo potter Trinidad Medina. Displayed at the entrance to the Court Restaurant and Lobby Lounge, it has become the Eldorado’s symbol of hospitality. From this central location, explore the lobbies on the first through fifth floors to see a fine collection of contemporary painting and prints by leading New Mexico artists including Tony Abeyta, John Fincher, Doug Coffin, and Ford Ruthling. Step into the Old House Restaurant off the main lobby to see a spectacular triptych of the Rio Grande by Douglas Johnson, Hopi masks by Greg Lomayesva, and an entire wall of Hopi Kachinas. The owner of these beautiful, small inns has assembled a superb collection of contemporary southwestern art. Each guest room has a subtle theme, carried through with custom furniture, original paintings, and engaging decorative objects. Some of the highly respected painters represented here include Robert Daughters, Jeff Aeling, Arlene Cisneros Sena, Tony Abeyta, William Hook, Donna Clair, Ed Sandoval, Roger Montoya, and Barbara Zaring. 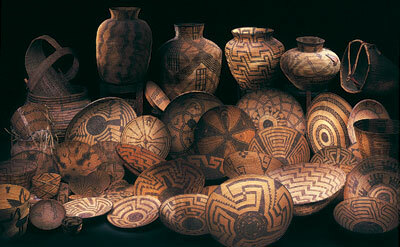 Decorative arts include top quality Pueblo pottery, Navajo rugs, Rio Grande blankets, and European ceramics. The collection is a work in progress and is more than worthy of repeat visits. The lobby of the St. Francis has the stately feel of a small, European hotel, with massive antique furniture and a proper high tea served with all the trimmings. The art, however, is pure New Mexico. 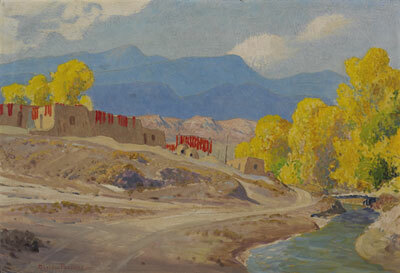 Three early members of the Santa Fe Art Colony, Sheldon Parsons, Fremont Ellis, and Warren Rollins are represented with large landscapes and Indian Pueblo scenes. Also check out the massive Colonial Revival style bar, c. 1905, a work of art in itself, and functional, too. Owned by the Pueblo of Picuris, Hotel Santa Fe is a beautiful, contemporary example of the Spanish/Pueblo revival style of architecture. At the entrance to the lobby are three large sculptures by renowned Apache artist Allan Houser. A fourth Houser bronze, an Apache dancer, greets you just inside the door. The lobby and hallways are adorned with contemporary Pueblo pottery and Navajo rugs. Paintings include a mystical bison/man by Armond Lara and a rhythmically stylized mural of Pueblo women grinding corn painted by Alfred Lutz in 1963. Even the men’s restroom boasts a classic serigraph by Houser. At the back of the lobby, check out the striking Navajo Crystal rug, c. 1910: a sophisticated piece of abstract art made before the term was barely even coined! If you’re exhausted after a day of touring and shopping in downtown Santa Fe, here’s the cure. Head to Inn at Loretto (just two blocks south of the plaza,) plop yourself into one of the overstuffed chairs in the lounge, and stare at the ceiling while waiting for your refreshment. A remarkable sight will come into focus above you: covering the ceiling is an intricate, whimsical, colorful assemblage of wood and paint by artist Greg Lomayesva. Lomayesva has developed a distinctive style of three-dimensional artwork based on the Kachina carving of his father’s Hopi heritage and the Hispanic Santos carving of his mother, the renowned artist and historian, Marie Romero Cash. Another example of Lomayesva’s art creates a unique entranceway into the Baleen Restaurant (renamed in 2009 the Luminaria Restaurant and Patio 505-984-7915) where you also can see several of his contemporary Hopi mask carvings. Original works by New Mexico artists adorn every guest room, as well as all the public spaces, of Inn of the Anasazi. Highlights include paintings by Emmi Whitehorse, Dan Namingha, and Doug Coffin, and sculpture by Arlo Namingha. A magnificent 3rd Phase Navajo chief’s blanket hangs above the reception desk, and three luscious abstract murals by Armond Lara are installed in the dining room booths. A sharp eye will pick out a variety of old and new Pueblo pottery, Southwestern baskets, and Plains beadwork subtly placed throughout the hotel. This luxury resort features a series of Southwestern casitas surrounding a Victorian mansion built by local merchant Abraham Staab in 1882. The Staab House retains much of its original splendor and is the venue for the resort’s changing fine art displays. Works include historical as well as contemporary painting in both representational and expressionist styles, contemporary photography, and sculpture. La Posada’s bar now occupies part of the Staab House, so a great way to enjoy the art is to take your refreshment across the hall into the “Library,” relax in the enormous sofas and easy chairs, and contemplate the fine canvases. One of the largest corporate art collections in the area is located at The Hyatt Regency Tamaya, about 45 minutes southwest of Santa Fe at Santa Ana Pueblo. When you enter the hotel’s lobby, ask for the color brochure that will lead you on an art tour through the complex. 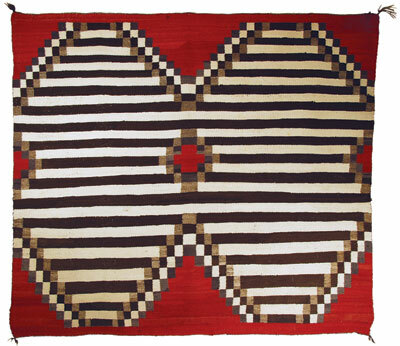 The collection features antique Native American art including Pueblo pottery, Navajo rugs, and Pima and Hopi baskets. Contemporary Pueblo and Navajo pottery displays include work by Rachel Medina, Ruby Panana and Louise Goodman. The diverse collection of contemporary painting, sculpture, and photography includes work by artists such as Jeff Aeling, Emmi Whitehorse, Phyllis Kapp, Julie Salazar, and Michael Eastman. A full-service resort with restaurant, pool, tennis, horseback riding, hiking and spa services, nestled in a quiet valley just 3 miles north of downtown Santa Fe. A modern luxury hotel just 2 blocks from the Plaza. Includes spa, pool, exercise room, restaurant, valet parking and butler service. Original Southwestern art adorns the 7 rooms and 1 suite of this adobe compound. Private baths, kiva fireplaces, patios, and expanded continental breakfast with sumptuous baked goods. An historic Route 66 motel in traditional Southwestern style. Pool, hot tub, sauna, continental breakfast, and several suites with kitchenettes. A charming, 5-room bed and breakfast inn featuring a collection of original Southwestern artwork including cholcha embroidery, handmade furniture, and retablos by the renowned santera, Arlene Cisneros Sena. Four Kachinas is owned and operated by the proprietors of El Farolito. On the National Register of Historic Places, this hotel offers European service, charm, and elegance just one block from the Plaza. Includes restaurant, bar, and afternoon tea in the lobby. 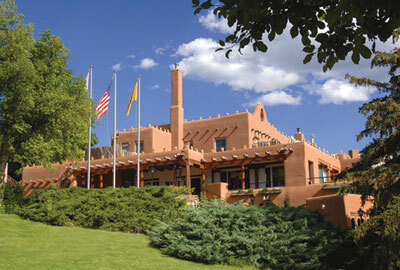 A luxury hotel in traditional Santa Fe style owned by Native Americans of the Picuris Pueblo. Pool, hot tub, restaurant, and complementary shuttle anywhere in the downtown area. Suites include microwave, minibar, and butler service. A modern, luxury hotel with Southwestern ambience, Inn at Loretto includes SpaTerre, Baleen Restaurant, and fine shopping, all just two blocks from the plaza. Just steps from the Plaza, this hotel offers contemporary Southwestern style in 51 rooms and suites with kiva fireplaces and four-poster beds. Restaurant, bar, wine cellar, and library/boardroom for meetings and events. Located one short block from the foot of Canyon Road, Inn on the Alameda is the perfect base from which to explore Santa Fe’s legendary gallery district. Amenities include lavish continental breakfast and an evening wine and cheese reception. A newly restored six-acre compound in contemporary Southwestern Style. Includes restaurant, bar, meeting rooms and the full-service Avanyu Spa. This article was excerpted from Canyon Road Arts: The Complete Visitors Guide to Arts, Dining and Santa Fe Lifestyle, Vol 2, 2006-2007, pages 36-41. Canyon Road Arts is published by Medicine Man Gallery. All rights reserved.